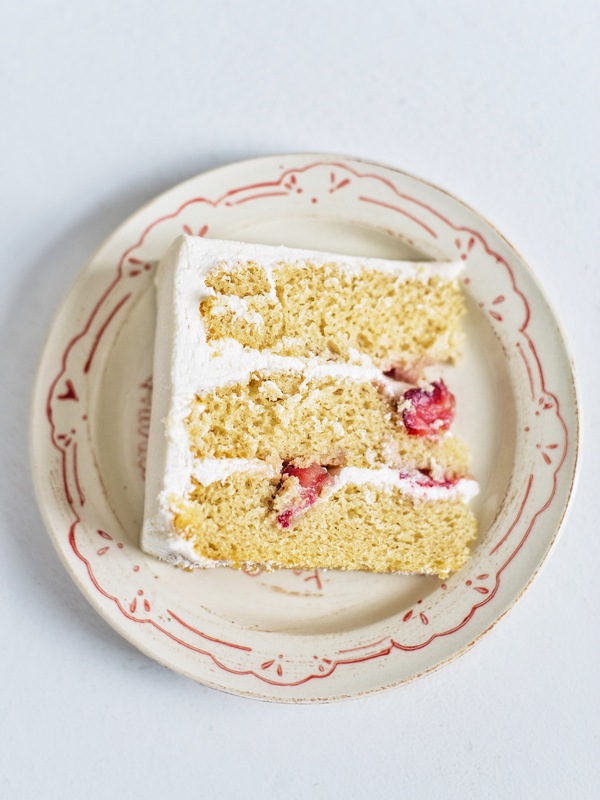 This egg-free and dairy-free vanilla cake is paired with a light and fluffy vanilla frosting and fresh strawberries. It’s finally time! My egg free and dairy free cakes are ready for you! After your positive reviews of my gluten-free vanilla cake, I decided it was time to tackle other common food allergies, like eggs and dairy. I just can’t stand the thought of you not eating good cake because of a few ingredients! So 12 rounds of cake making later, I think I’ve come up with some pretty fabulous egg-free and dairy-free vanilla and chocolate cakes. Yes, that’s right. Not one, but two egg-free and dairy-free cakes! This was a major labor of love, but I can’t even begin to tell you how excited I am with how both cakes turned out. While each failed attempt was discouraging, I actually really enjoyed teaching myself the science behind creating a recipe without the typical dairy and eggs I’m used to. Plus, finally coming up with two recipes I love, was worth every failed attempt. 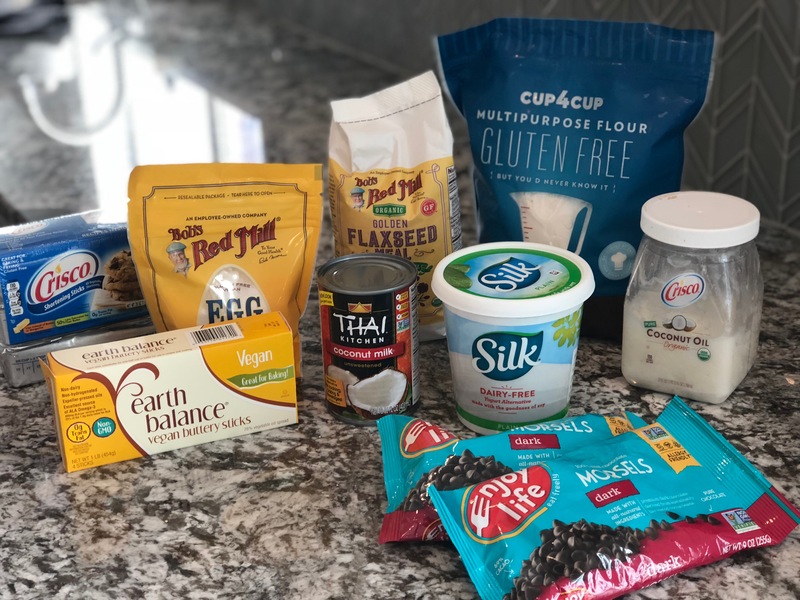 Before I got in the kitchen, I tried to do as much research as possible on what the best egg and dairy substitutes are. I read loads of articles, blogs, and recipes, trying to figure out what worked and didn’t work for other bakers. But there was really no way of knowing what I like best if I didn’t try it all for myself. So, I narrowed down the substitutes to just a handful – one that were rated highly by others, but also ones that I thought would be easiest for you to find in your home or at any ordinary grocery store. Here were the key players in the game and a quick personal review of each, followed by more detail of how each substitute worked in my cake. Bob’s Red Mill Egg Replacement: rated highly by others but I didn’t think it did a good job binding the ingredients together. My cake with this egg replacement crumbled easily. Flaxseed Egg: (1 tablespoon golden flaxseed with 3 tablespoons water). Another egg replacement liked by many, including me. I think it did a good job binding the ingredients but I found out it’s not necessary in a cake. I think it will be useful to use in cookies and brownies though. Keep this one in mind for other egg-free baked goods for sure! Chickpea Water: Yup, as gross as it sounds, some people like it for an egg replacement, but I could totally taste the flavor in my cake and in a meringue frosting I made with it. I don’t recommend it. Vinegar: My winner! Forget the egg substitutes and just throw in a tablespoon of white distilled vinegar with a couple teaspoons of baking soda and you’ll get a cake that rises beautifully. Earth Balance Butter: too much of this butter in a frosting was overly sweet, but just a little and it provided a great texture and flavor. This butter replacement works well in cookies too. Hi-Ratio Shortening: for frostings, I prefer hi-ratio shortening because it contains emulsifiers which make the shortening smoother and creamier. This shortening is also more stable than regular shortening. In the frosting, I noticed shortening by itself was a little bland, but when combined with a little Earth Balance Butter, the flavors balanced each other well. Almond Milk: I always have almond milk on-hand, so this is one of the easiest substitutions for me to make. Canned Coconut Milk: I was worried about having a coconut flavor in my frosting or batter, but with the cocoa powder (for my chocolate cake), you don’t even notice it. The canned coconut milk (mixed well) is a great replacement for buttermilk, and also makes for a silky and rich chocolate buttercream (which I decided not to post, because it wasn’t stable enough for a layered cake, but man did it taste good!). For the base of my vanilla cake, I decided to use my classic yellow cake as a starting point. 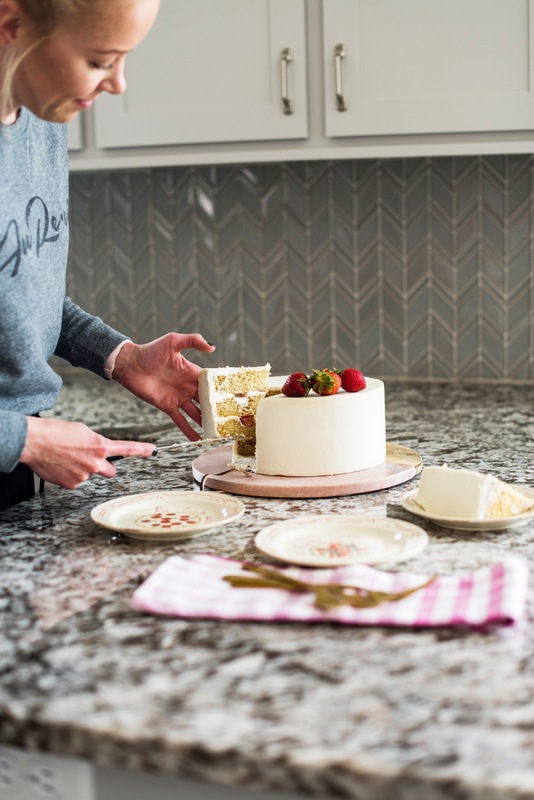 It’s not only one of my favorite cakes, but I think you’ll also be able to alter it a few ways to get some different flavors (i.e. sub 1/4 cup sugar for 1/4 cup strawberry Jell-O or add some cinnamon and a layer of brown sugar and cinnamon mixed together to recreate my Churro Cake). My original recipe calls for butter, eggs and sour cream. 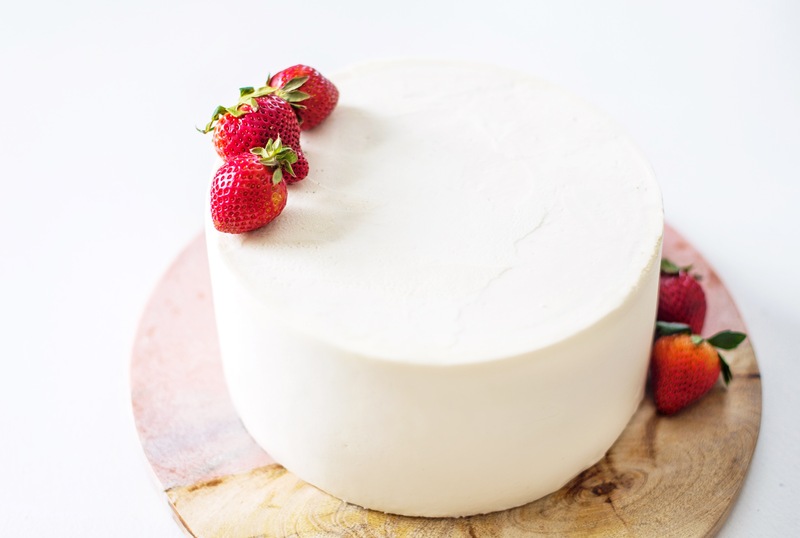 When converting a cake to egg and/or dairy free, and losing those ingredients, some of the biggest hurdles to cross are making sure your cake rises and that it gets enough moisture – which will give it right flavor and texture – the most important elements of any cake, in my opinion. If I couldn’t achieve a flavor and texture that met my expectations for cake, it wouldn’t be worth sharing with you. Bob’s Red Mill Egg Replacement: Let’s start with the egg substitutes, since figuring this out was my biggest challenge. I had read great things about the Bob’s Red Mill Egg Replacement and decided to give that a try first. For round one of the vanilla cake, I used Earth Balance Vegan Butter to replace my regular butter, as well as the Bob’s Red Mill Egg Substitute and some dairy-free yogurt to replace the sour cream. The result of this attempt was a cake that didn’t rise and was too dense. It was also very fragile. I’m not sure the Bob’s Red Mill Egg Replacement did a good job at binding the ingredients. Flaxseed Egg: I then went on to try the flaxseed egg (1 tablespoon flaxseed mixed with 3 tablespoons water) instead of the Bob’s Red Mill Egg Replacement. I also switched the non-dairy yogurt for almond milk. This second round produced a cake with flex of flaxseed, which I didn’t love to see in the cake, but also didn’t mind since the cake stuck together better. However, this cake sunk a little in the middle so it wasn’t a winner either. Chickpea Water: For my third and fourth rounds, I stuck with the flaxseed egg and almond milk, but changed up my ratio of baking soda and baking powder. Neither round met my expectations. For my fifth round, I tried chickpea water as a substitute for the egg, but could totally taste the flavor of the chickpeas and threw it away without a second thought. Vinegar: Heading into my sixth round, I decided to add some vinegar mixed with baking soda to the recipe – similar to what you do with a red velvet cake. I mixed all the ingredients and then added the vinegar and baking soda mixture at the end. The batter tasted great, but the cake sank again! Ugh! I was so confused. I went back to my research and reread everything about vinegar. Several sources claimed it was a great way to get your cake to rise… and then it hit me… I needed to do it without the egg replacement. So, for round seven, I still had the vegan butter, almond milk and then a full tablespoon of vinegar with a couple teaspoons of baking soda. I was eager to see how this one would turn out. I was certain it would be perfect. Nope. Sank again. I nearly gave up, especially when my little Avery told me I should. (Haha!) But there was no way I was going to quit at that point. I gave myself a break and tried to think through it all. What was I missing in this equation? And then it finally dawned on me. I had yet to try a version without the butter. What if the butter was weighing the cake down? It had plenty of moisture from the almond milk and oil, so what purpose was the butter serving? In round eight, I made the recipe without the butter, increased the almond milk and oil a little, removed the baking powder and only used baking soda and threw in the vinegar again. The result? A tender and perfectly risen vanilla cake. Victory! As for the frosting, I ended up with a blend of vegan butter and hi-ratio shortening. 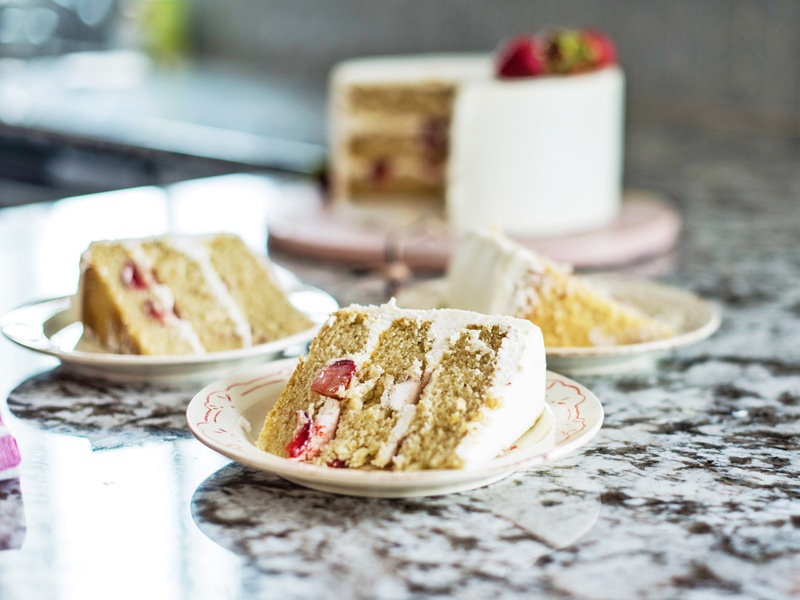 The texture glides onto the cake beautifully and the taste is sweet, but light and fluffy, so it doesn’t overpower the cake. I’ll be posting my egg-free and dairy-free chocolate cake with chocolate frosting later this week. Both cakes and frostings work great together, so feel free to mix it up when you start baking. 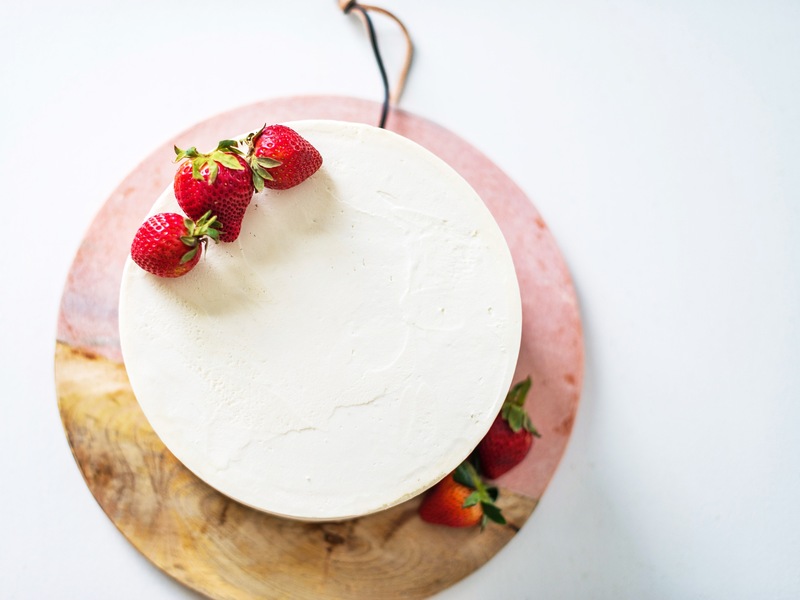 A tender egg-free and dairy-free vanilla cake with a light and fluffy vanilla frosting and fresh strawberries. Preheat your oven to 350 degrees F. Spray each of the three 8-inch pans with non-stick spray, line the bottoms of each pan with parchment rounds, and spray again. Set aside. In a large liquid measuring bowl, combine the almond milk, vanilla, oil and vinegar. Set aside. In the bowl of a stand mixer fitted with the paddle attachment, combine the cake flour, sugar, baking soda, and salt. Stir to combine. With the mixer on low speed, add the wet ingredients to the dry ingredients. Stir just until incorporated. Scrape down the sides and bottom of the bowl and mix again on low for another 10 to 20 seconds. Divide the batter evenly between the three pans (about 16 ounces of batter in each pan). Bake for 22 to 25 minutes, or until a toothpick inserted in the center of the cake comes out with just a few moist crumbs on it. Let cool 1o minutes in the pans before inverting onto wire racks to cool completely. If needed, level each cake layer with a cake leveler. 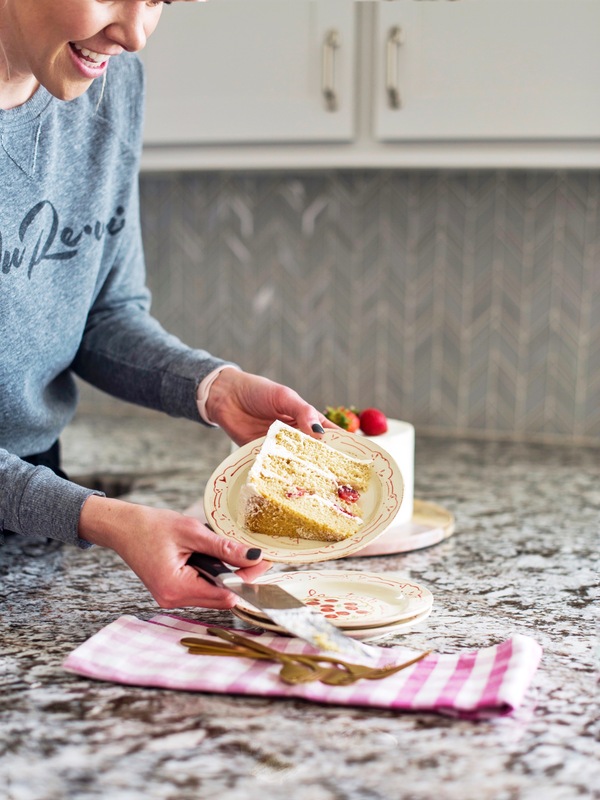 To store the cake layers, wrap each cake layer in plastic wrap after it's completely cooled. The cake layers can be stored in the freezer for up to a week with two layers of plastic wrap. To store longer, wrap the layers in an additional layer of foil and place in a zip-lock bag. In the bowl of a stand mixer fitted with the paddle attachment, combine the vegan butter and shortening. Beat on medium speed until light and fluffy, about 2 minutes. With the mixer on low speed, gradually add the sifted powdered sugar and then vanilla. Once the sugar and vanilla are incorporated, turn the mixer to medium-high and beat for an additional 3 to 5 minutes. To get rid of any air pockets, use a wooden spoon or spatula to stir the frosting by hand for a couple minutes. Place the first cake layer bottom-side down, in the center of the cake board. Using an offset palette knife, spread about 3/4 cup frosting evenly across the cake layer. Layer with strawberries, if using. Place the second cake layer on top of the frosting. Frost the top of the second cake and add strawberries, if using. Place the third cake layer, top side down, on top of the frosting. Crumb coat the entire cake with a thin layer of frosting and freeze for about 10 to 15 minutes to set. Once the crumb coat is set, continue to frost the cake with the remaining frosting. *Hi-ratio shortening contains more emulsifiers than regular shortening, giving it a smoother and creamier texture than regular shortening. Hi-ratio shortening is also more stable than regular shortening. Thank you so much for this recipe. I’m so excited to try it today! One question though, if I’m good with dairy, can I substitute regular milk for the almond milk in this recipe? I’m so excited to try this recipe! I haven’t yet had a successful white vegan cake. My daughter has food allergies and her bday is coming up, so I will have to test this out! Where can I find the hi-ratio shortening? Is it best priced on Amazon or can I find it in stores in Utah? Thank you for creating this recipe! Yay! Can’t wait for you to try it. You can find hi-ratio shortening at Orson Gygi in Salt Lake or Amazon. I love the outcome of this cake, so soft, moist and delicious! Thank you for sharing . This is fantastic and looks delicious. Thank you so much for your research, as a new mom, I appreciate any help or time saving techniques I can get. My 10 month old son is allergic to dairy, egg, peanuts and all tree nuts. I want to make him a smash cake for his birthday and was wondering what your thoughts are on making a few substitutions. Do you think it would work if we used soy milk, vanilla bean (instead of the extract because it contains alcohol, but would losing the liquid form make it less moist/fluffy) and then lastly, can we make it with less sugar? Maybe one cup? Hi Naomi! Yes, you can certainly make substitutions. I prefer coconut milk over soy milk for cakes, if he can do coconut. And yes, vanilla bean paste will work perfectly! Hi! thanks for the recipe. If making with dairy products do you recommend buttermilk? or just milk? also will adding sour cream add to the taste? (if so how much?) thanks! I personally would use buttermilk. I don’t think you’d need to add sour cream. I recently found out I have a really bad egg allergy and my baby has a dairy allergy. It has been so hard! I was crying reading this it made me so happy! I am so grateful you put in the effort to make these recipes. I love making your cakes and am happy I can continue to do so! Thank you! You are so sweet. I hope you love this recipe! I don’t have a recipe for coconut buttercream unless you use the chocolate vegan buttercream. You could certainly whip coconut cream and add powdered sugar to it and make a whipped cream frosting. I would like to make a combo of the egg and dairy free vanilla cake with the egg and dairy free chocolate frosting for a church function. I need to drop it off on Sunday morning, but it won’t be served intil Monday night. Will the cake and frosting be okay or will it stiffen up too much because of the dairy free and egg replacement ingredients? The cake will be great. The frosting might stiffin up a bit. Wow! This cake turned out so good! I am making a smash cake for a little guy with dietary restrictions and I’m so glad I was able to make him something he could eat! Thanks for all your hard work in getting this recipe right! I can’t stop eating the cake tops 🙂 thank you!! Oh I’m so happy to hear how much you love it! ps: this is for the chocolate cake.. i was not able to post the comment on that page. The one tablespoon vinegar with 2 teaspoons baking soda works great. Don’t worry about a 1 for 1 switch. ah I’ve tried two other egg &dairy free white cake recipes today from other sites and they were both disasters. after reading about all your attempts and experiments i had suuuuuch high hopes for this cake… but it sank so badly in the middle i wanted to cry when i pulled it out of the oven. the only thing i changed was that i used apple cider vinegar instead of white, but i cant believe that would have such a big effect! Actually, yes, the vinegar makes a difference, as does the baking soda… it needs to be fresh – nothing older than 6 months from the time you bought it. This cake is supposed to rise beautifully. Hi! This sounds great and I can’t wait to try it ! I’m wondering- if I want to make this cake but free and leave out the almond milk would rice or soy milk be a good substitute? Or coconut milk but don’t want too much of that coconut taste. ThNks ! It’s a light and fluffy cake – I spoon my flour into my measuring cups and level off with a knife. I do not have 8 inch cake pans. Can you bake this in two 9-inch pans (instead of the three 8-inch pans); or do you think it would be ok to increase the recipe by 25% to accommodate for the larger pans? Thanks for your help! Yes to both! you can certainly make my recipe, as is, in two 9-inch pans and increase the bake time by a few minutes, or add another quarter of the recipe and use three 9-inch pans. This recipe is game changing. I’ve tried it with tremendous success! Thank you so much for this incredible recipe and the thorough research you put into it. Great recipe! It does wonders for a house that doesn’t allow dairy or eggs! What shortening did you end up using in the last run of the recipe? I used vegetable shortening and think the frosting came out a bit thicker than yours looks. Hi! How long can the frosting stay in the fridge for? Seems like a couple weeks at least, right? THANKS!! I would love to make this cake, but need measurements for 2 8 inch layers. Could you help? Also, is it possible to give a weight measurement for the cake flour? What an amazing recipe thank you! I am baking this for my god daughters birthday on this Saturday. How far in advance can this be made without having to freeze or refrigerate? Is two days ok? It will be stored in a sealed container. Have you tied this yet with gluten free flour? Have a friend whose child is gluten, dairy and eggg free. I have made your gluten free cakes with King Arthur Measure for Measure Gluten Free flour and they came out beautifully. I made this one substituting that flour for regular flour. The batter tasted fine – just a bit grainy. The cakes rose beautifully and a toothpick came out clean. When I took them out of the pan they were a bit sticky around the edges and it didn’t taste as good as the batter. Any thoughts of what went wrong? Or what to try? Thank you! This one is a little trickier since it’s also vegan. I haven’t used measure for measure but love Cup 4 Cup because it doesn’t come out grainy. Thank you for trying so many ways to make this dairy and egg free! The tips really help. My son is allergic to egg, dairy, and peanuts so I’m always trying to find ways to convert recipes for him. Really appreciate you taking the time to share and try so many products! Look forward to making this cake.